If the end of the year is a time for reflecting, the beginning of the year is a time for doing. The days between the holidays and New Year’s exists in a surreal passage of time where it’s difficult to even remember what day it is... but at soon as the new year starts, it feels like the traffic light just turned green. And with a festival on the horizon (February 10), our team is hitting 2019 with our foot on the gas pedal. For those who may not yet have heard, thanks to a grant from the city of Austin’s Cultural Arts Division, collective blue is producing a festival called missfits fest – a one-day festival celebrating Asian-American women in entrepreneurship and the arts. From speaker panels on mental health, sexuality, media representation, and pursuing a creative career, comedy, live music performances, a Bollywood dance workshop, craft vendors, DJ sets, to a night food market, we have a lot of exciting work on our plate. But while we’re elbows deep in “doing,” our reflections from last year still guide our work and shapes January’s theme. We started missfits fest to celebrate the shared experiences of Asian-American women while also bringing to the forefront the qualities that make us unique, affirming us as writers of our own narratives. To exemplify this month’s theme of “individuality,” we’re featuring our fellow missfits fest collaborator, Kristina Gonzalez Sander. A multidisciplinary creative and logistical badass, Kristina is the Project Manager for Party at the Moontower (a minority and woman-owned event furniture rental company), and recently founded in bold company, an online journal exploring the raw stories of women of color. The daughter of Filipino immigrants, Kristina grew up in the suburbs outside of Chicago. The community she lived in severely lacked in diversity, and a distinct disconnect from her parents’ culture and people marked her early years. 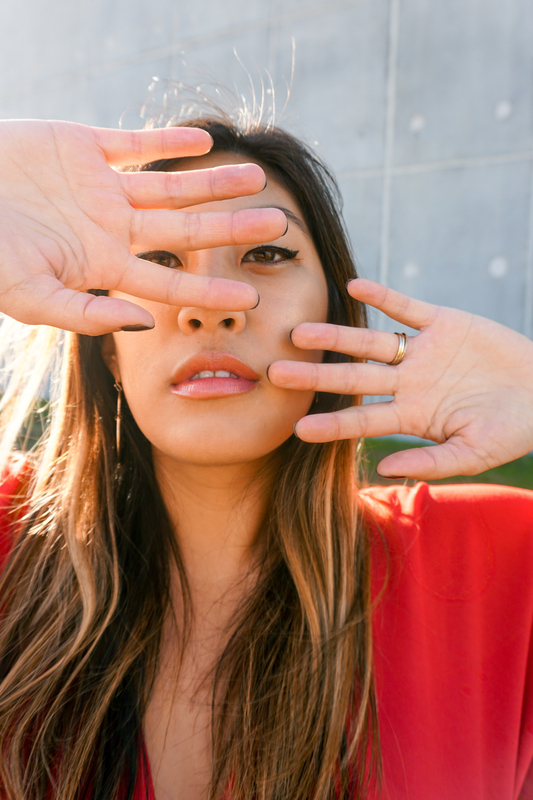 Eager to reconnect with her Filipino heritage, Kristina not only started seeking out minority communities but also worked to create opportunities for people to share their own experiences with their cultural identities. Though Kristina was accustomed to thriving in environments where she was often singled out as one of the few, she has an intrinsic understanding of the importance of community. “[Your own people] just understand you in a different way,” explains Kristina. She believes that when you’re around other people with similar backgrounds as you, you gain a strong built-in support system that backs you up without you having to explain yourself. As a woman of color, Kristina actively seeks and creates that support from and for others. After collaborating on numerous projects centered around storytelling, identity, and self-expression, Kristina gained the insight, skills, the inspiration to start her own project, in bold company. The online journal serves as a space for women of color to explore their multidimensional selves and to spark genuine, vulnerable conversations about identity. Kristina knows that there is no one uniform experience when it comes to identity. Her environment as a child and the lessons she learned as an adult shape an experience and perspective that is uniquely hers. Though it can seem like a paradox at times, individual identities is what ties her communities together. Through in bold company, Kristina hopes to portray women of color as individuals – highlighting personal stories as counter narratives to societal stereotypes. Kristina’s desire to highlight women of color and their stories also drives her work with missfits fest. Kristina joined our missfits organizing team last August with the shared goal of increasing visibility and opportunities for Asian-American women – starting first in Austin. in bold company launched their first storyteller campaign earlier this month on Instagram! Be sure to follow the account and check out the campaign. We’re beyond excited to work on missfits fest with Kristina, and this festival is collective blue’s most ambitious and impactful project yet. We’re grateful for the overwhelming support from the community, and we can’t say thank you enough. You can grab your early bird tickets ($15) for missfits fest here, and see y’all February 10!